The Chupacabra is another legendary beast that is sometimes reportedly seen in Texas. The name is Spanish for “Goat Sucker.” The reason it has a Spanish name is that the creatures were first seen in Puerto Rico. Sightings spread from there to Mexico and other parts of Latin America. 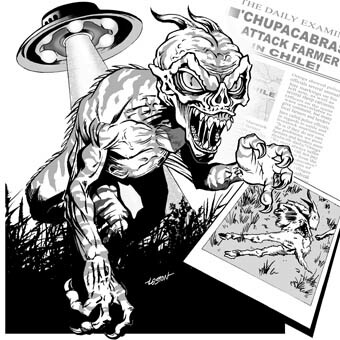 Unlike Bigfoot and black panther sightings which date back for more than a hundred years, Chupacabra sightings, according to most authorities, date back only to the 1970s, and to no earlier than the 60s or 50s. Because of this, and because they were at first limited to Latin American countries, it was assumed by many that the Chupacabra was no more than a superstitious regional legend, and that encounters in South Texas were a logical extension of it, as the creature attained legendary status. There is another aspect of the Chupacabra mystery that links it with Bigfoot and black panthers in Texas. The following is a statement from Nick Redfern, a Dallas resident who is the author of Three Men Seeking Monsters, published by Paraview-Pocket in 2004, and numerous other paranormal investigative books. “In the summer of 2004, myself and Jonathan Downes from the British Center for Fortean Zoology traveled to Puerto Rico in search of the Chupacabras. We spent a week traveling around the El Yunque rainforest, the lowlands and the farms interviewing a whole range of people.These included ranchers, policemen, government employees, members of the public and veterinarians. “We were particularly impressed by the witnesses and their consistent accounts of finding their animals - usually chickens and goats––drained of blood via two small puncture marks, usually on the neck. Several of the people we spoke with had seen the Chupacabras up close and described it as having a body somewhat like a monkey but with large, leathery bat-like wings and self-illuminating, glowing red eyes. What particularly interested us was the fact that many people who had seen the Chupacabras had also seen strange balls of glowing light in the exact same vicinity where the attacks had occurred. 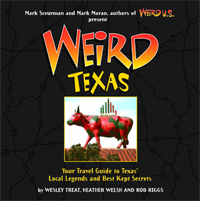 If there are Chupacabras in Texas, judging from Nick’s statement, they would probably fit right in with Bigfoot and black panthers in the menagerie of bizarre beasts that prowl the woods and remote areas of the Lone Star State. July and October of 2004 showed a rash of Chupacabra sightings in Texas. An Elmendorf rancher reported shooting one of the creatures and notified authorities of the possibly diseased animal that was killing his livestock. Pictures were taken of the creature but the rancher buried the remains before further investigation of the dead creature could be performed. On a television newscast, the rancher found and interred the buried remains. Samples of tissue and blood were taking for analysis. A Lufkin resident shot and killed a very similar creature in October. The resident was alerted to trouble by the family dogs barking and whining in the yard. The dogs indicated that the creature was under the house. After being shot, it was dragged out using a rope. A local veterinarian could not identify what type of animal it was. Oddly enough, while driving out to the home, one of these creatures darted out in front of the veterinarian’s vehicle. Some have speculated that it was the mate to the killed animal. Pictures of the dead critter show an emaciated animal with bluish grey skin. It looked similar to a starving greyhound with a serious case of mange. Its mouth had long upper and lower canine teeth and a rat-like tail that curled behind its hind legs. You would say that it’s a dog, but it did not have the angular skull like one. The back legs were longer than the front, like a kangaroo’s. It had a sloping forehead not unlike a deer’s. When they picked up the head by the ear to photograph it better, the ear crumbled in their hands. The body looked like it had been dead for over a month but it had only been a matter of hours. Its weight was 15 to 20 lbs. Some say it may be a cross between a coyote or wolf and a dog but, but this is not likely. Whatever this creature was, it had never been seen before. It has totally baffled many trained animal experts. Now that they have fresher tissue and blood samples at the Texas Animal Health Commission, maybe a clearer picture of what this freak of nature that has been roaming the Texas ranches and farmlands really is. In the summer of 1999, I was camping on my friend’s property outside of Amarillo, Texas. There were three of us out there that night. We had just graduated high school, were all going off to college in the fall, and spent as much time as we could hanging out, goofing off, and doing the sort of dumb things kids that age do. We often camped on Ray’s property. We’d make a fire, drink some beers, smoke cigars, that sort of thing.